The chaotic traffic scene of capital Dhaka is Bangladesh’s worst image problem abroad. Yet, it appears that practically all visible steps to improve it have failed. Why? Experts say finding a solution to this problem was very complex, but not impossible. Seeking anonymity, an on-duty sergeant told the daily sun, that motorcycles and trucks were a major problem as they are prone to speeding which is responsible for accidents. “Sometimes, our signals are violated. And we have nothing to do as we have to deal with hundreds of vehicles within few times,” he added. 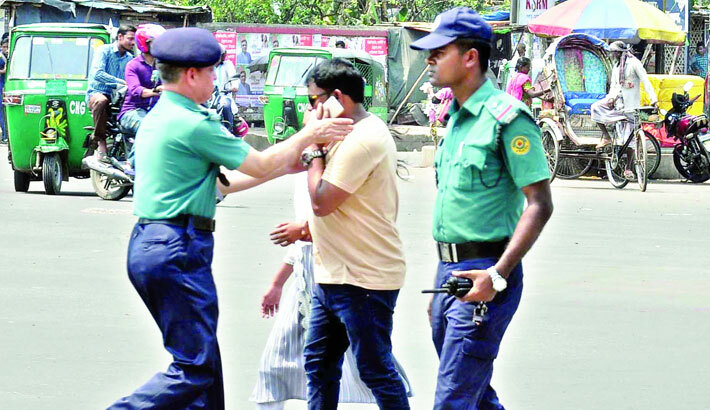 The Dhaka Metropolitan Police (DMP) organised several programmes, including traffic weeks, to bring discipline on the roads since August last year, but it failed to achieve its purpose, said sources in DMP’s Traffic Division. The traffic division organised five traffic weeks and special drives since the mid-2018. The first traffic week was held from August 5 to August 14, the second between September 5 and September 30, the third between October 24 to October 31, fourth January 15 to February 2, and the fifth from March 17 to March 23. Several lakh more cases were added to the existing ones during this time. During the latest traffic week, police filed 7,252 cases against vehicles on March 19 and 5,885 on March 22. The total data of the latest traffic week is yet to be gotten. But during the period of its previous traffic week from January 15 to February 2, police lodged 1,12,558 cases and realised Tk 5,71,53,600 in fine. According to the DMP research, about 7,000 buses of 250 companies ply in the city streets. Recently, DMP published a major list of guidance for the drivers and the pedestrians on how to use the roads. In instruction no. 5, it has asked instructed the drivers not to change lanes on the main roads frequently. They appear to have been ignored. The instruction no 4 says the drivers must follow the speed limit. A bus of Anabil Paribahan from Kuril Biswa Road was heading towards Jatrabari. It reached near Nadda moving from left right in utter disregards to the traffic rules. Although experts have, over the years blamed, corruption for the traffic jam, especially police. If police gets tough, it would be easy to end the chaotic traffic status of Dhaka. In Daily Sun’s commentary on Thursday, Consulting Editor Nadeem Qadir wrote that the graft nexus of vehicle owners, police and the BRTA needs to be corrected to achieve positive results. It was found motorcycles, rickshaws, covered vans and pickups from Post Office Lane and Hasan Uddin Road and the lane beside the Ulope at Madya Badda were seen moving towards Madya Badda Kitchen Market driving wrong side on Pragati Sarani on Friday noon. Abdur Rahman, owner of a grocery at Badya Badda, told the daily sun that the wrong side driving was rampant. “Sometimes, traffic police resist them, but the drivers hardly listen to the police,” he said. Several traffic policemen were seen posted at the RK Mission Road but did not stop vehicles operating on the wrong side of the road. An on-duty police constable wishing not to be named said they are tired of checking the vehicles. “Whenever we resist them, they said they have no alternative way sans wrong side driving. Actually, we cannot disagree with them because there is no other option,” he said. Traffic Division during the latest traffic week filed 5,334 cases against vehicle drivers for wrong side driving in the last four days since March 18. But, many commuters said they were unaware about zebra crossings and its use. As per the DMP, small buses should be removed from the city streets and big buses with two doors to be operated. The bus stoppages should be a few away from crossings and intersections. It will be better if each stoppage has passenger camp. Every passenger must get into bus with ticket. DMP thinks the will and wish picking and dropping passengers without ticket cause indiscipline in roads. The doors of busses must be stopped from one stoppage to another that will encourage passengers to get into buses from the fixed stoppages. Drivers and other staffers of buses must be on salary basis, but not contractual. The staffers should have uniforms. A Worker Welfare Fund should be formed for them. Monitoring should be done by bus owners and their associations if the buses are being run properly. Skilled and experience drivers should be appointed. The owners must have garages to park their buses after trips. The buses must not be parked on the roads. Routes should be mentioned on the buses. Traffic police should be given duty at each bus stoppage.